As spring approaches the hen harrier will be looking for a place to nest in uplands and on deep heather moorland, young forest plantations and scrub habitats. There are few greater sights than these magnificent birds display in the skies. The 2015 Irish Hen Harrier Survey is co-ordinated by a partnership of the Golden Eagle Trust, Irish Raptor Study Group and BirdWatch Ireland on behalf of the National Parks & Wildlife Service of the Department of Arts, Heritage & the Gaeltacht. This bird, is protected by the EU Birds Directive and research and protection areas are vital to the conservation of the species. The survey will monitor data collected during national surveys throughout Ireland and will be used by Government and other agencies to help inform management and conservation decision making. 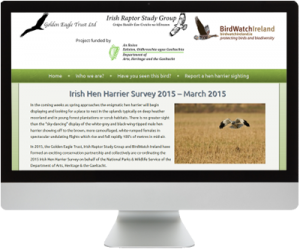 We created a data entry portal website at http://www.irishhenharriersurvey.com/ to allow bird watchers to submit sightings of this magnificent species. The site also includes identification guides as well as information on all the organisations involved in this conservation project.